The set up at Junkyard Golf Club Manchester. Crazy golf's taking another step away from its seaside roots next month, as Junkyard Golf Club arrives in London. For three months, The Old Truman Brewery will be taken over by a load of rubbish — literally — in the form of crazy golf courses. 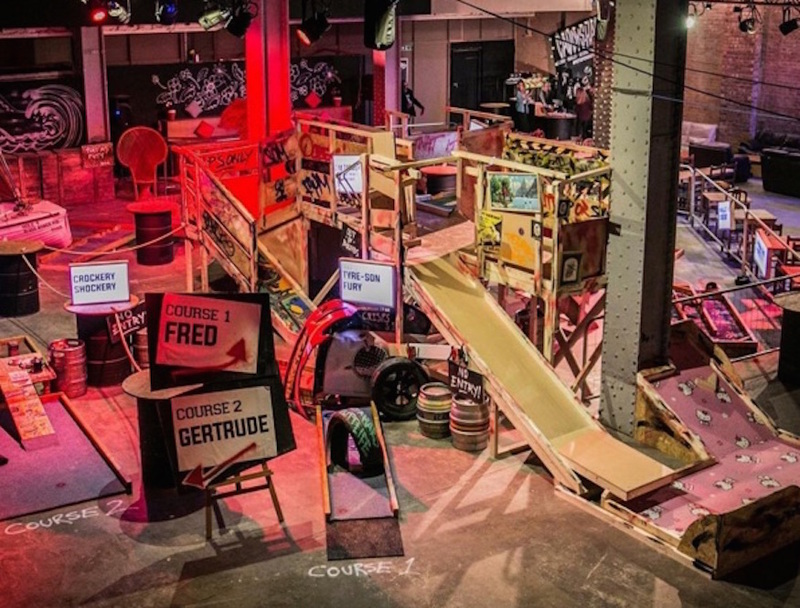 Junkyard Golf Club, already established in Manchester, uses the sort of stuff you'd find at car boot sales, charity shops and junkyards to create the courses. Players can choose from three courses: Pedro (Polluted Paradise), Frank (Putt Up Or Shut Up) and Helga (In Da Club) incorporating jacuzzis, slides, speed boats, wendy houses, cows (presumably not living) and treadmills to navigate around. Of course, no self-respecting pop-up comes without a side of street food these days, so nachos, hot dogs and the like will be available to buy to fuel you round the course, plus golf-themed cocktails (Tee Diddy, anyone?) will be served at the four bars. Junkyard Golf Club is at The Old Truman Brewery in Brick Lane 12 May-7 August, 11am-11pm daily. Tickets are £8.50 per person Sunday-Thursday, or £9.50 per person Friday-Saturday. Tickets go on sale 11 April at 6pm.